﻿ Goodstay Hotel Amaranth, Sokcho-si | FROM $36 - SAVE ON AGODA! 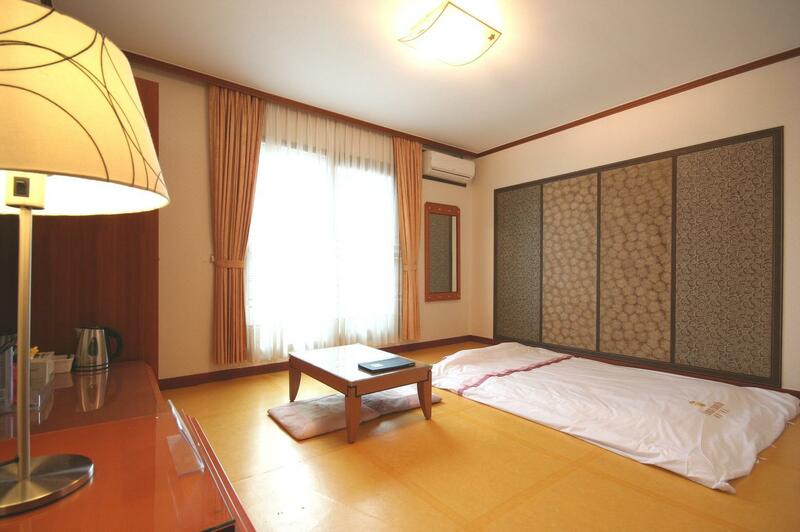 "Nice interior with modern and traditional Korean style, clea..."
Have a question for Goodstay Hotel Amaranth? "I will come back here when I get in Sokcho again." "Very friendly & helpful staff at the reception." "Staff is very helpful, room is spacious and clean, nice mt s..."
Designed for both business and leisure travel, Goodstay Hotel Amaranth is ideally situated in Seoraksan; one of the city's most popular locales. Situated only 3.2 Km from the city center, guests are well located to enjoy the town's attractions and activities. With its convenient location, the hotel offers easy access to the city's must-see destinations. At Goodstay Hotel Amaranth, the excellent service and superior facilities make for an unforgettable stay. To name a few of the hotel's facilities, there are free Wi-Fi in all rooms, daily housekeeping, taxi service, 24-hour front desk, luggage storage. Hotel accommodations have been carefully appointed to the highest degree of comfort and convenience. In some of the rooms, guests can find television LCD/plasma screen, internet access – wireless, internet access – wireless (complimentary), air conditioning, heating. Whether you're a fitness enthusiast or are just looking for a way to unwind after a hard day, you will be entertained by top-class recreational facilities such as golf course (within 3 km), garden. Whatever your purpose of visit, Goodstay Hotel Amaranth is an excellent choice for your stay in Sokcho-si. A little bit far from downtown (but there's city bus) but all the aspects are perfect for travelers. Nice interior with modern and traditional Korean style, clean, spacious. I will come back here when I get in Sokcho again. The rooms were large and nicely equipped and decorated. Everything was very clean. The bathroom was more of a functional kind and looked a bit old, but it was very clean and provided everything needed. Staff is very friendly and the man at the front desk spoke good English. On my way back to the Sokcho Express Bus Terminal they drove me there by car. The major downside for me was the location as I had no car: I wanted to visit Seoraksan Park and it takes very long to get there by bus (over 1h) and there are not many busses, so I had to order a taxi. If you have a car, then it is no Problem. Big Room, near the mountain. It was a pleasant surprise when we arrive at the hotel. The room is quite nice for the price. The hotel looks old but well maintained. It us a good place if you will be going to the mountain. But if you are planning to stay at sokcho for quite some time I suggest not to stay in this hotel. Bus to the city proper runs every hour which is quite a wait. Taxi from sokcho intecity terminal bus is around 7000 to 8000 won. While taxi from hotel to the mountain is about 5000 to 6000 won. Room is large by comparison fee. Staffs are kind and polite. Fee is low. We enjoyed staying Sok-cho city very well. Room is clean and large. There is a staff that can speak Japanese. Not good point is what the hotel is far from center of city. But it is near from Hanwha resort. Hanwha resort's pool is so wonderful! We chose this hotel because we wanted to do hiking in Mt Seorak.. With staff able to communicate in English and giving direction written in English save us a lot of problem. Public transport is convenient from Hotel. The next day after the hike, we took a public transport that is just opposite the hotel down to the city.You can get fresh seafood at their local price if you approach a local buying at the same time ( you just have to be friendly) . Stayed at this hotel for one night and it was a good experience. For those who plan to go to Mount Seorak, it is a recommended place to stay. The taxi ride from the hotel to Mount Seorak took less than 15 minutes. However, the location of the hotel is quite a distance from downtown. So if you opt to have a meal outside the hotel, you may need to take a taxi or a bus ride to the nearby town. Overall, it was a good short stay at Ritzcal and of course the staff always serve you with a smile on their face. my friend and i went to ritzcal on the 1st day we arrived in korea. there was a bus no.3 to get there directly and the staffs at the fo s really helpful and friendly. the favorite part for us was the real traditional ondol style room with the warm floor which made us really just like living in a traditional korean house. it was really unforgettable and relaxing. We visited Seoul in Nov and came to know Mount Seorak is the most recommended place to pay a visit during autumn season for its best scenery & sightseeing experience. Since it only took less than 3 hours to reach Sokcho (city where Mount Seorak is located), we decided to make a detour. Reason why we pick Goodstay Ritzcal Hotel: 1. the award of "Goodstay" by the relevant authority assure us we will get a quality stay 2. the price is reasonable and we even get some great discount via agoda booking 3. the location is very strategic. The hotel is located in between of the mountain and city and only took us less than 15 min to reach the entrance. The hotel staffs are very helpful and friendly. Although they not really speak good english but try to provide us as much of assistance. i stayed with a group of relatives, and we are impressed! even the wing we stayed with an old but already renovated building, we can sense that the owner/management team had put extra care to this hotel. the room is spacious, and clean very worth for the money we paid.. the buffet line for breakfast is awesome, better than what i earlier imagined. only one weakness is the old wing i stayed in has no lift so that it is a bit difficult for elder people to climb up stairs..however, the employees are good to assign the room on the 2nd floor. oh, and it would be good if there is a curtain to separate the wet area in bathroom! thank you for a good time you created! The location is perfect between beach area and the Seorak mountain. One can reach either destination within 10-15 min max by local taxi. Perfect, if you like both destinations like me. I split my entire vacation equally between the mountains and the beach. The landscape is a beauty, site to behold! Do not think twice before booking this place. The staff was incredibly kind and helpful and we loved the location (its on a peaceful road a ways out of town, anout a 5000 won taxi ride from downtown). My only real complaint was the lack of air flow in the room. They unfortunately dont turn on the air cons in the rooms before June and there are no fans, so it can get very stuffy and uncomfortable at night. this hotel is very clean and tidy, it's provide what you need during the trip. Easy to access to both sokcho city and seorak mountain. The reception proactively provide us a information sheet for easy acces to the spot around the hotel. Recommend to stay! We were pleasantly surprised that the room has just been refurbished so it's clean and well-maintain! For the low price we paid definitely worth it. Highly recommended. Taxi to Mt Seorak is 5mins away. Bus-stop right infront of the hotel. I was staying here for 1 night and had a pleasant experience. Room is clean, and toilet has a bathtub. Value for money. The only bad thing was that there isn't any wardrobe to put your clothes but its fine for me. I was here not for vacation but hoping to find family of someone from the Osaek Seoraksan area. That said, it is located close to both Sokcho and the National park. If you don't have a car you can walk into town or take the bust which the stop is in front of the hotel. The staff are very knowledgeable about avail be transportation and sites from what I witnessed. I slept with the window open and it was very refreshing. Another thing about the area is that some resteraunts require a 2 ppl minimum so keep that in mind and don't be offended for you soloists. I would stay there again. We really enjoyed our stay at Goodstay Ritzcal Hotel, Sokcho. Easy to communicate with staff in English. Less than 10 min to the hotel from down-town (Sokcho beach - really a nice place to enjoy) by public transport or taxi. It will take less than 7000 KRW from down-town to hotel by taxi. Better value for money...Highly recommended.. The location is terrific, the staff is friendly, the hotel was clean and quiet. My family and I enjoyed our stay. The Goodstay Ritzcal has a restaurant which we visited for breakfast. We thought the American breakfast was a great value. Across the street, there is a delicious mom and pop restaurant too. The staff recommended it as a dinner option. The beds are firm, but we have slept on harder ones. We actually slept very well. The tub is nice and deep and my kids liked it. The bathroom towels are very small, but that is typical in Korea. The air conditioning works terrific. We had two rooms to accommodate our family of five. Our kids are 21, 14, and 8. We had standard rooms with one bed each, we packed an air mattress to be safe which we did use. We would gladly stay here again. With a family of 5, we had to get two separate rooms but that wasn't really much of an issue at $50/room. The staff is extremely friendly and accomodating. We got both the westernized and "ondol" rooms. The rooms are a bit on the small size (about 15X15) but are very clean, well maintained and, much to our pleasant surprise, did not have the ubiquitous moldy smell that is pervasive in many Korean hotel/motels outside of Seoul. It has a flat screen TV, a small table, and even a small fridge. The bathroom, also very clean, has a tub with a removable shower head. Since we had our own car it wasn't a problem but with the the hotel being about 15 minutes away from downtown Sokcho, that could be an issue for those without their own rides. The lack of proximity might account for the lower rate. That or the fact that we visited right before the summer vacation season. All in all, if you don't mind staying a bit away from the city center, this place should suit you just fine.